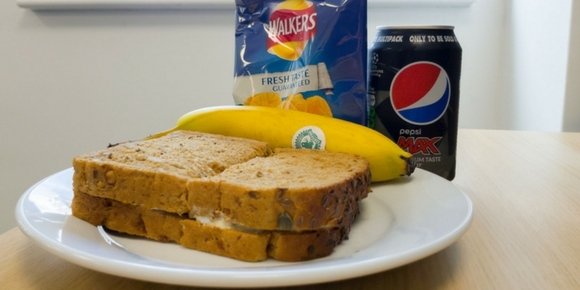 Supermarket lunch meal deals might seem like a bargain, but they can still cost you around £15-25 a week for your lunch. That soon adds up! 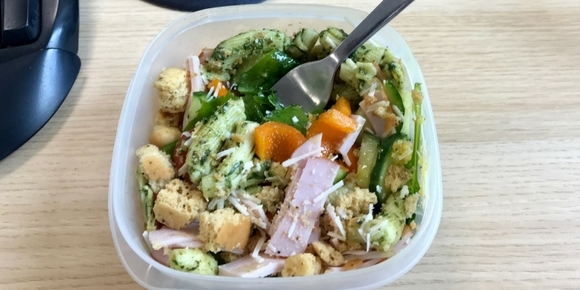 I challenged the team to make their own cheap meal deal lunches for one week, swapping a supermarket meal deal with an absolute steal deal (I’m not even sorry for that terrible pun). I’ve brought packed lunches to work for 20+ years. Before ‘£3 meal deals’ (yes, there was a time before) I couldn’t afford to buy everything from the local sandwich shop. Every week, my wife and I get a bag of spinach or lettuce, cherry tomatoes, a cucumber, two peppers, ham/chicken slices, a couple of pasta salad tubs, and water (Sometimes I push the boat out and buy fizzy water.) It’s around £5 for everything, and it usually covers both of us for five days. Alongside this, crisps are six packets for £1, yogurts at eight for £2 and we spend £3 on fruit. That’s about £15 a week, or £1.50 a lunch each. Who needs a £3 meal deal! It’s cheap, it’s healthy, we can spend more on evening meals instead, and our weekend lunches (from a well-known baker) are seen as a treat. I take a ‘whatever I fancy’ attitude to lunch, but that comes with a price. £20 a week, actually. I swapped spontaneity for preparation, choosing a simple Cajun ‘cook in the bag’ kit for £1 to cook the week’s lunches on Sunday afternoon. I mixed together three chicken breasts (by far the most expensive ingredient at £3.78), two handfuls of broccoli, a sliced red pepper, three portions of basmati rice, and the spices and water into the bag. 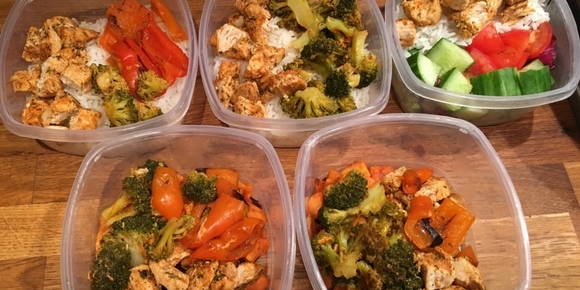 When cooked, I divided the meal into lunch boxes and popped them in the fridge. Make sure you let the rice cool down quickly in the fridge instead of the worktop. Nobody wants a bout of food poisoning! The NHS website has useful tips for cooking rice safely. I added a bit of variety with sweet potato and salad (already in my fridge) instead of rice for two of the days. And to save more money, I drank free tea in the office instead of buying pop. This brought my weekly spend down to £7.24 – worth the saving, even if I was incredibly bored of chicken by Wednesday. I’m now a weekly food plan convert! 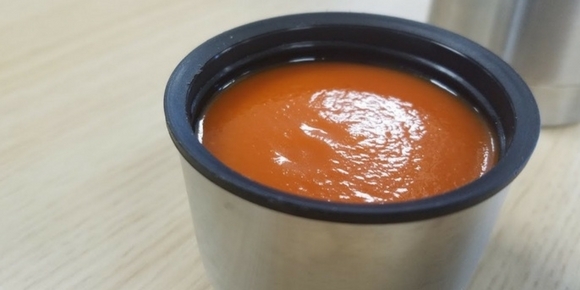 Taking a flask of soup to work is a way to have a hot, cheap, and healthy lunch. It also means you don’t have to wrestle for the office microwave to heat up your lunch. My flask cost less than £5 from a discount shop and paid for itself in the first week of taking soup to work. A can of soup is around 40p, so it’s around £3 a day cheaper than getting a meal deal. If you don’t fancy tinned soup, we’ve already written about 8 frugal soup recipes you can cook instead. I like having my lunch in a flask and ready to eat because it means I’m not restricted to the office kitchen on my lunch hour. I can pop out to the park, get some fresh air and eat/drink/slurp my soup in peace. 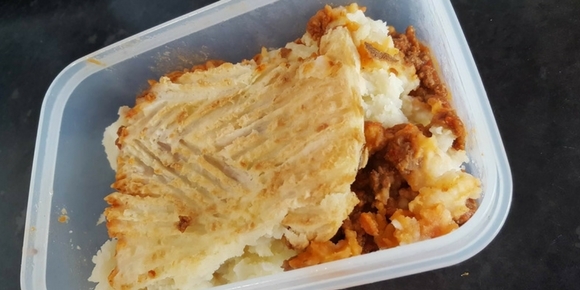 Thanks to inflation, a portion of cottage pie has gone up to 92p in price since the last time I made it (a 9p difference) but it’s still my favourite choice for cheap and hearty leftovers. Our shepherd’s pie divides into three generous portions. If you make two pies at once, that’s five portions for the week plus one extra to put in the freezer. Changing your veggies or pulses per pie is key to preventing tastebud boredom. Add variety to your pie by throwing in a 35p tin of own-brand beans or a bag of frozen mixed veggies that costs around 70-80p for a big bag. Want a fizzy drink with your lunch? Invest in a plastic funnel at £1.25. You can use it to refill a small bottle of pop. It’ll save you a chunk of change over time! I’m a habitual meal deal buyer, favouring convenience over cost. My challenge is to directly replace my meal deals, but at a lower price. I replaced my packaged sandwich with sandwich fillers and bought a loaf of bread. Turns out they taste identical to the ones in the meal deals and were much cheaper, but I didn’t get as much variety. I bought multipack crisps and fruit for less than £2 which was a bonus, as you usually only get one choice of snack in the meal deal. Although water would have been healthier, I wanted to make this a fair comparison so I bought fizzy pop to wash down my lunch. These cans were the most expensive part of my deal at £3.50, but it still worked out substantially cheaper. Overall I saved £7 in a week for minimal effort. That’s around £300 a year if I stick to the same routine, which I plan to! Have you discovered any homemade meal deals that save you money? Tell us in the comments.